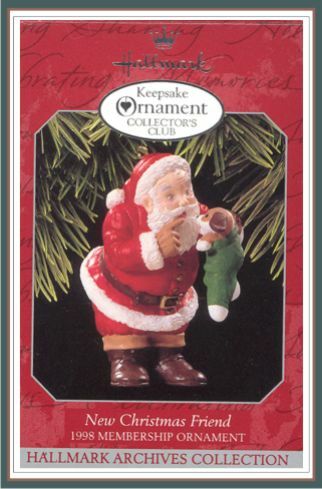 New Christmas Friend - (KOCC) Keepsake Collector's Club Ornament - Hallmark Archives Collection - Handcrafted - Dated 1998 - Sculpted by Joanne Eschrich. QXC4516. Inspired by an original 1885 Hallmark greeting card from the Hallmark Archives. MIB with normal box aging. Has No Price Tag since this is a Club ornament. Never been used.